Rendering of Greenpoint Landing Development. Image Credit: Handel Architects. Large Greenpoint Developments, if approved, would produce over 1,400 housing units. On October 30, 2013, the City Planning Commission unanimously voted to approve two major mixed-use developments in Greenpoint, Brooklyn: Greenpoint Landing and 77 Commercial Street. Both projects would allow the City to fulfill commitments to affordable housing and public open space that it made during the 2005 Greenpoint-Williamsburg Rezoning. The 2005 Rezoning of nearly 200 blocks authorized the transformation of Greenpoint’s low-density manufacturing sector along the waterfront north of the Williamsburg Bridge into a strip of high-density residential towers of mixed use-residential space. The first project, Greenpoint Landing Associates, is proposed by the Department of Housing Preservation and Development (HPD) and Park Tower Group. Greenpoint Landing plans to construct 431 units of affordable and 263 units of market-rate housing. The project will create approximately 3.3 acres of publicly accessible open space, provide $2.5 million in funding for the expansion of Newtown Barge Park, and construct a primary or intermediate public school with approximately 640 seats. 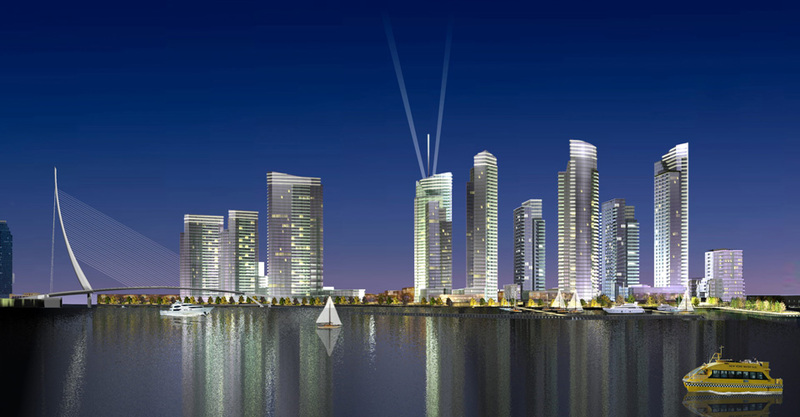 The second project, 77 Commercial Street, is proposed by Chetrit Group under the name Waterview at Greenpoint. The project includes the development of a six-story base building containing 200 units of affordable housing, two separate towers housing 520 units of market-rate housing, approximately 25,000 sq. ft. of ground floor retail, community space, and a garage. Greenpoint Landing sought zoning text amendments to preserve development rights on a City-owned site designated for future parkland in order to facilitate the construction of affordable housing and a school. HPD sought an Urban Development Action Area designation of 73,389 sq. ft. of City-owned land located at 16 DuPont Street and 219 West Street. The municipal lot is currently a partially vacant waterfront property containing a sludge tank and open vehicle and equipment storage. Greenpoint Landing will also develop an as-of-right development project on a site it controls adjoining the City-owned property. 77 Commercial Street is currently a two-story warehouse, which covers a majority of the lot and operates on a short-term lease. Waterview at Greenpoint sought a zoning special permit for maximum base and building heights and minimum setbacks which it contends are needed to accommodate the development, enhanced flood resiliency, and site design. Waterview at Greenpoint also applied with the Department of City Planning for a zoning text amendment to facilitate the planned mixed-use development. Brooklyn Community Board 1 and Borough President Marty Markowitz approved the project with conditions that largely dealt with strains on public transportation and the project’s affordable housing component. During the CPC public hearing on October 9, 2013, Jack Hammer, the Director of Brooklyn Planning at HPD, stated that the 2005 Points of Agreement identified a number of City-owned sites as potential locations for affordable housing developments. Hammer stated that this site “represented by far the largest number of units that could be developed of the sites listed” in the Points of Agreement. He stated that it is a key site and “a great opportunity to fulfill the main commandments of the points of agreement” from HPD and the City’s point of view. Several Greenpoint residents, including members of Save Greenpoint, opposed the two projects, stating that the community did not want luxury towers wrapping the Greenpoint Waterfront. Residents noted that the area is characterized by buildings that are one to three stories tall with occasional six story buildings. Residents also cited transportation, infrastructure, and traffic issues presented by this project. They stated that there were no effective transportation solutions or alternatives to address the area’s projected population increase. The G train, currently the only train serving the area, is at 86 to 88 percent capacity, and that shuttle buses to Long Island City would suffer from existing traffic congestion to and from the Pulaski Bridge. Opponents also stated that the development of Greenpoint Landing and 77 Commercial St will unearth harmful toxic chemicals into the local environment. The next stage for the Greenpoint Landing and 77 Commercial Street applications is City Council public hearing and review. The local City Council Members for the area are Stephen Levin and Diana Reyna. Council Member Reyna’s term will end on December 31, 2013, and Council Member Antonio Reynoso will assume the council seat for District 34 on January 1, 2014. (CIT): City Planning: Greenpoint Landing (C 140019 HAK – Urban Development Action Areas); (N 140028 ZRK – zoning text amendment); (N 140020 ZAK – zoning authorization) (N 140021 ZAK – zoning authorization); (N 140022 ZAK – zoning authorization); (N 140023 ZAK – zoning authorization); (N 140024 ZCK – zoning certification) ; (N 140025 ZCK – zoning certification) ; (N 140026 ZCK – zoning certification) ; (N 140027 ZCK – zoning certification); (N 140028 ZRK – zoning text amendment) (October 30, 2013); City Planning: 77 Commercial (N 140048 ZAK – zoning authorization); (N 140049 ZAK – zoning authorization); (N 140045 ZRK – zoning text amendment); (N 140050 ZCK – zoning certification)(October 30, 2013).